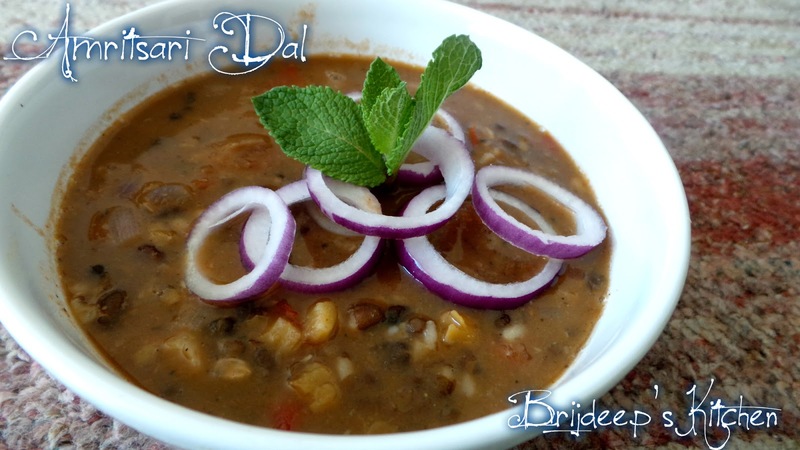 A dal so light and flavorful, a dal so very easy to prepare without the use of any ingredients such as cream, cashews, yogurt, milk or the like. This is the dal which is served in Gurudwaras in Langar and guess who taught me this recipe? Yes, the one and only my Nani Ji who worked as a 'gurudwara granthi' all her life. Kasoori methi (crushed): 1/2 tsp. 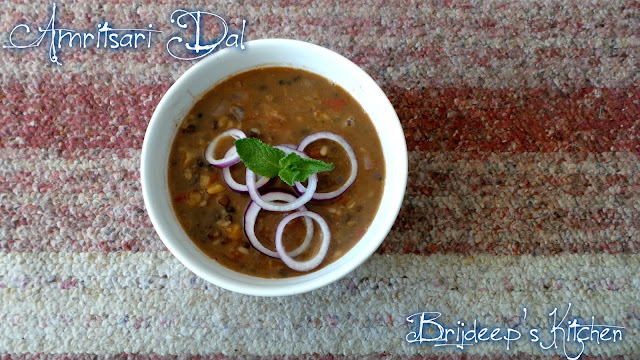 Soak the black urad dal in warm water for about 4-6 hours and the chana dal in another bowl of warm water for about an hour. Drain the water and wash well. Boil in a pressure cooker with salt, 1 tsp. red chili powder and the chopped ginger till 7-8 whistles. Let the pressure release itself. By the time, make the masala. Heat oil on medium flame and crackle the cumin seeds. Add the crushed ginger-garlic and the green chilli and fry for about a minute. Add the onions and mix, fry until the onions are turning transparent but don't let them brown. Add the tomatoes and sprinkle little salt. Let cook until the tomatoes are completely soft and mushy. Add 1 tsp. red chilli powder and coriander powder. Mix well and turn off the flame. Open the pressure cooker and mash the dals together completely. Add the prepared masala to the dal and simmer for about 20 minutes. Serve with chappati or rice. 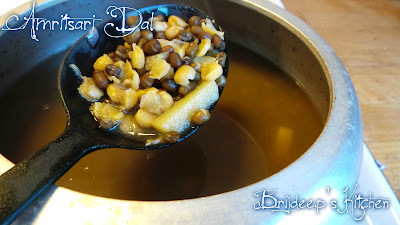 The above method is how the langar wali dal is made for gurudwaras. But we do make it often at home so for home we add a little bit more, to impart little taste. Add the crushed kasoori methi and garam masala in step 6 before mixing in with the dal. Also, this dal is never garnished with coriander (do we ever see any garnish in langar food? No.) 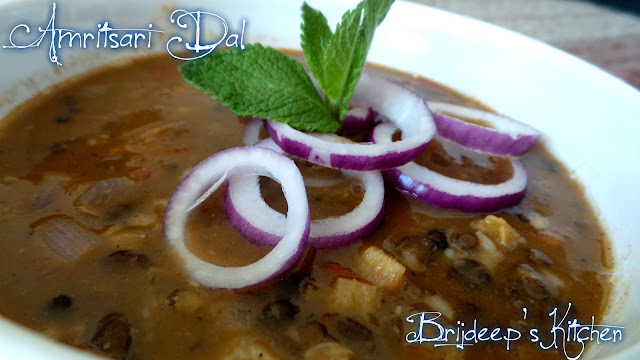 but Nani told me it's also not done at home because this dal has no combination with coriander garnish. So, when preparing at home, always garnish with fresh mint leaves, or nothing at all. Enjoy !!! Also, don't forget to connect with me on my Facebook Page for regular recipe updates.